If you like a New Year's party, Thailand is the place for you. 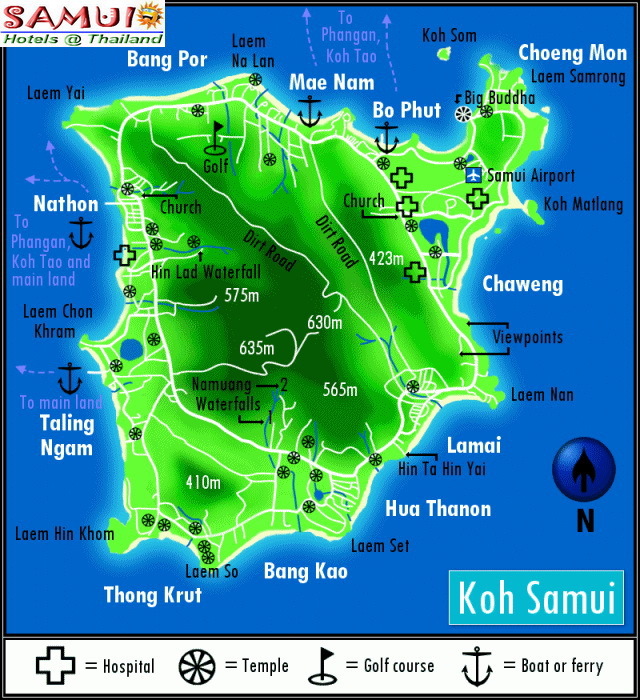 Samui's people are blessed with no less than three annual opportunities to ring in a new year with their European friends on January 1st, with their Chinese friends in early February, and on April 13, which has for centuries marked the first day of of the traditional Thai solar calendar. 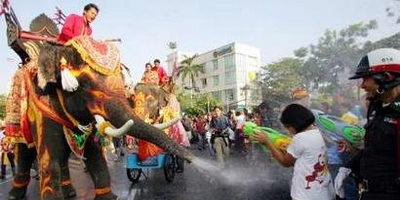 This last celebration is called Songkran, and it is one of the most joyous occasions in The Kingdom. The word Songkran comes from the Sanskrit words for "New Year", and the Thai celebration was probably imported with major aspects of Indian culture over 2,500 years ago. Songkran in Thailand is a holiday primarily dedicated to the family, and tourists may notice a much slimmer staff manning the restaurants and hotels as every employee who is able goes home to spend the day with his or her relatives. Back in the provinces huge meals are pre-pared, homes are fastidiously cleaned, and sacred altars and images respectfully washed. Family members who are scattered for the rest of the year by employment or marriage come together to renew their bonds and exchange gossip. Perhaps the most lovely rite associated with Songkran is the wai khon gaa ceremony, where whole neighborhoods will line up to pour water over the hands of the community's two oldest members, giving and receiving blessings for the coming year. Unfortunately, because over 90% of the Thai people on Samui are originally from other provinces, it is not easy to find these ancient and moving ceremonies here. 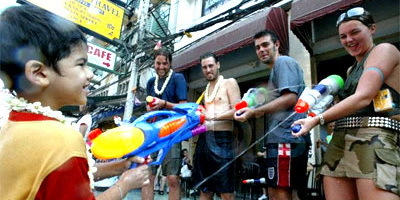 The most common manifestation of Songkran to be seen on Samui is the practice of sat nam, which means gaining control of large quantities of water, preferably chilled to just below freezing, and an advantageous spot from which to surprise and drench passing unwary pedestrians. On April 13 every year the streets of every town and village on the island are lined with giggling teenagers armed with and arsenal of water guns, buckets. barrels , dippers, hoses and all manner of delivery vehicle with which to launch their often icy-cold liquid missiles. Only police officers in uniform are immune to attack; everyone else is expected to take their punishment with good humor. It is not uncommon to enter the post office, bank or some other place of business and be greeted by a smiling clerk wearing a sopping wet shirt and tie. While we may be able to trace the source of the holiday itself, nobody knows for sure why Thai people delight in dousing each other in cold water on Songkran day, or why it is apparently even more fun to douse strangers, especially foreign strangers. What is obvious is that the practice of throwing water around on one of the hottest days of the year releases tensions, cooling the head along with the body. And during this day a visitor has only two choices, 1) hide in his room or 2)join in the fun and sling a little water of his own. 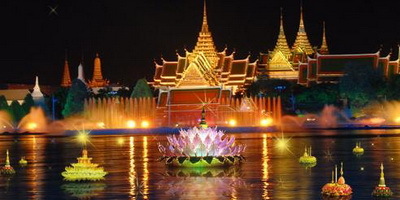 Thailand's waterways rivers, klongs, even hotel swimming pools will be ablaze with dazing lights on the evening of Nov. 14, when the Kingdom celebrates "Loy Krathong" one of the year's most-awaited festivals. The annual festival, also celebrated in other neighboring countries, is held on the full moon day of the 12th lunar month. Thais place great importance in this event and while the best celebrations are said to be held in Bangkok, Ayutthaya, Sukhothai and Chiangmai, the event and while the best celebrations are said to be held in Bangkok, Ayutthaya, Sukhothai and Chiangmai, the event is marked with great funfair all over the Kingdom. The festival is believed to have its beginnings at least in Thailand in Sukhothai Province, north of Bangkok, almost 800 years ago. 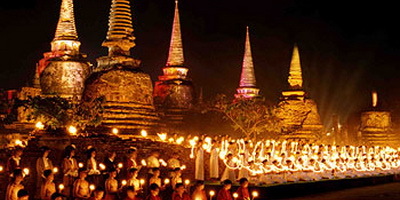 A stone inscription from the Sukhothai Period describes an ancient Loy Krathong festival : "There are four main gates in the city of Sukhothai. On festive occasions, people jam the city to witness the light festival in progress. It's as if the city would burst." When the ancient Sukhothai city was restored to its former splendor as the Historical Park of Sukhothai, efforts were made to bring back ancient festivals and their legendary festive atmosphere. This brought back the light festival of Loy Krathong. It has remained a major attraction since. This moniker seems apt as most floating objects you see during Loy Krathong nights are flowers formed like cups, if not artificial petals that look like cups in many angles. It is a most colorful festival. In most areas where it is celebrated, you will see Thai women resplendent in colorful attire, hair festooned with flowers, and gaily-dressed men, also fully garbed, gather with floats in their hands wherever there's water. As the krathongs meander while making their way downstream, you'll often see little boys swim to them to retrieve the tiny cargo of coins before releasing them down the "river of no return". Explanation of the festival's significance vary. One belief is that as the floats embark on their journey, they take with it the owner's misfortunes. Most Thais also believe the floating of the krathong is a yearly sloughing off of all the sins and calamities that have befallen a person. On a lighter note, it's also believed that lovers can forecast the fortune of their romance by watching their krathong float downstream to gather. Krathongs that remain together into the darkness, promise life-long partnership. This custom's religious significance is somewhat debatable, though. Some say Loy Krathong is an act of remission to the goddess Mae Khongkha, the mother of water. Western psychologists say it symbolizes the egg's prenatal consciousness of its journey of the ovary down the fallopian tube to conception, a legend (for explanation) quite common to Eastern and Western cultures. The Biblical story of Moses in the Bulrushes is similar. Whatever its significance, you shouldn't fail to watch or join in a Loy Krathong festival for a once in a life time experience. Check out the hotels or your travel agent for a schedule. There are about 10,000 peoples every month at this Koh Phangan beach party. It is of course known as the Full Moon Party. Thaiand International DJ's are making the crowd go wild. Paint yourself in UV colors and let your body lose control. The DJ's play all kinds of music; Techno, Trance, Goa, D&B, Dub, Reggae, Commercial hits, House etc. There are many small tables on the beach where you can sit down with your friends or meet new ones. You can order drinks and food from restaurants and bars next to the beach. The party is at the south-eastern part of the island at Haad Rin Beach. The regular boats are going 4 times a day from Bophut and Big Buddha Beach, Koh Samui (70 Baht). Speedboats are operating all night long. They can be booked at nearly every travel agency for 300-400 Baht/roundtrip. There are about 3000 beds at Had Rin, which is of course not enough, so make sure you arrive a day or two before the party. If you cant get a room at Haad Rin take a taxi to the other parts of the island where you can find all kinds of accommodation. Most resorts require a 3-4 nights stay during the party time. Don't bring any valuables to the party...take only the money you will need for the night. Don't take any drugs or drinks from strangers. Wear shoes to be protected from broken glass and hot cigarette butts. for Haad Rin accommodations Click Here!